AMD has now disclosed the availability date for the two additional members of its 2nd Generation Ryzen Threadripper family. The AMD Threadripper 2970WX for extreme workstations as well as the AMD Threadripper 2920X for high-end desktops will be available for purchase globally on October 29. 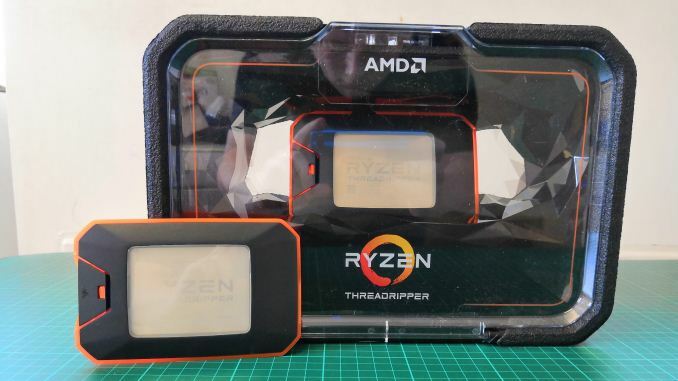 The AMD Ryzen Threadripper 2970WX processor is similar to the 2990WX, which uses four eight-core Zeppelin dies on a single piece of substrate, but with one core disabled within each CCX (two per die). The CPU thus has 24 cores with SMT technology and running at 3.0-4.2 GHz, 64 MB of cache, a quad-channel DDR4-2933 memory subsystem, and 60+4 lanes of PCIe Gen 3. The chip has a 250 W TDP and therefore greatly benefits from the latest AMD X399-based motherboards with enhanced VRMs as well as high-performance coolers designed to dissipate such a vast amount of thermal energy. Designed for high-end desktops for enthusiasts, the Ryzen Threadripper 2920X uses two Zen+ dies with two cores disabled within each of them. Running its 12 cores with SMT at 3.5-4.3 GHz, the chip offers 32 MB of cache, a quad-channel DDR4-2933 memory subsystem, and 60+4 lanes of PCIe Gen 3. With a TDP of 180 W, the “baby” Threadripper 2 is compatible with any AMD X399-powered platform with a proper BIOS. Meanwhile, since such chips are made to be overclocked, a motherboard with a reliable VRM and a robust cooler are highly recommended since power consumption and TDP tend to skyrocket on overclocked processors. AMD is also noting today that these parts will feature a 'Dynamic Local Mode', designed to arrange the NUMA such that cores with direct access to memory have priority, although we will have to look deeper into this feature. The AMD Ryzen Threadripper 2970WX processor will retail for $1,299, whereas the Ryzen Threadripper 2920X will cost $649. Both will be available on October 29 from leading retailers. Like Tchamber said, that's not how percentages work..